Now Proudly brought to you by the Robot Workshop! There are excellent examples of each one of the HERO Robots (along with most options) in the Robot Gallery collection. Along with the robots there are also some rare prototype parts and some of the original Heathkit test fixtures used to repair the robots. If you happen to know of any other prototypes or anyone who worked on the HERO robots at Heathkit please let me know! Of all the educational and personal robots created during the 1980’s the Heathkit HERO robots were by far the most successful and most popular. The talented engineers at Heathkit originally created the HERO robots and supported the HERO robot line up until 1995 when it sold the remaining inventory of HERO parts and rights to a company in Redford, Michigan called Mobile Ed Productions. Since 1995 I have been working with Mobile Ed and in 2002 bought out the remaining HERO parts and rights for the robots (including documentation) from them. At the present time there are no longer any full robots (kit or assembled) available to be purchased new. If you are looking for one you may have some luck finding one for sale on the net. If you have a HERO I can help with repairs and upgrades to get it going again. Unfortunately most of the original tooling which created these robots was destroyed and has to be recreated from scratch. There are still many original parts available as well as new options and new reproduction parts. More items are being added all the time. In the future there may be entire robots available again…. Be sure to check the Robot Workshop section of the website for more information and updates. The Heathkit HERO robots make a great robot to start with. 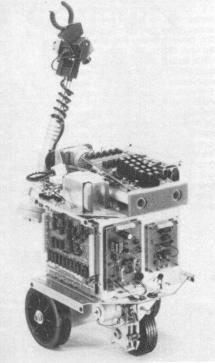 Heathkit made four Robot Models, they are the original HERO 1, the HERO JR, the HERO 2000, and the Arm Trainer base. 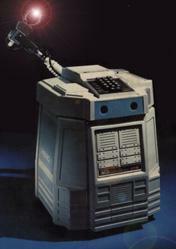 The HERO 1 was the first and most popular robot model. The HERO JR came out after the HERO 1 and was created by the consumer division as a personal robot instead of an educational one. This is one of the reasons that there is not nearly as much technical information about the JR. They borrowed heavily from the HERO 1 robot, but made some changes so that it would be much less expensive and simpler to operate. The HERO 1, HERO 2000, and the Arm Trainer were all made by the educational division and had much more documentation and expandability. Both the HERO 1 and HERO JR are very much alike, and even share many of the same components. The HERO 2000 and the Arm Trainer share the same Arm and use the same BASIC commands for movement that the HERO 2000 uses, but it is mounted on a stationary base and uses a Z80 microprocessor as the main CPU instead of the 8088 like the HERO 2000 robot. I have used the teaching pendant to go through a series of steps and train the Arm using the Arm Trainer, then I have uploaded the steps to my notebook PC and then used the same BASIC code to drive the Arm of the HERO 2000. (Creating the Arm movements is much easier with the Arm Trainer and Pendant) The HERO 1 and HERO JR both share a common version of Wintek Tiny BASIC with the only difference being the extra support for the Arm commands on the HERO 1. On each circuit board there is the board part number and the date code. If you have the HERO 1 Main drive board part# 85-2566-1 you will notice the date code of 021282. Which is February 12th, 1982. Every Heath board seems to follow this rule. Here are the specs for the Heathkit HERO robots. 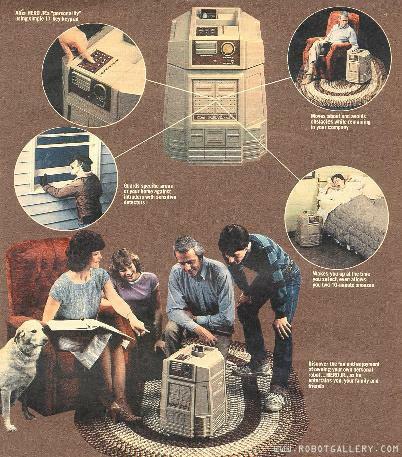 Much of it is from original Heathkit ads for the robots. An ideal teaching tool, HERO 1 is a completely self-contained robot that interacts with you and its environment. It’s excellent for learning the components and circuitry of robots, as well as artificial intelligence. HERO 1 has incredible sensing capabilities. It detects sound, light, motion, and obstacles and travels over a course that you predetermine. The robot can see and hear through on-board light, sound, and motion detectors, plus a sonar ranging system. The sound detector hears over a 200 to 5000 Hz frequency range while the light detector sees over the entire visible spectrum and into the infrared range. HERO 1’s motion detector senses movement up to a distance of 15 feet while a sonar system determines direction and ranges between objects and the robot from 4″ to 8 feet away. An optical encoder provides precise measurements of distance traveled. To make HERO 1 even more life-like, the head rotates 350 degrees to position sensors and arm. Seven stepper motors control all movements. Plus powerful front wheel DC motors drive and steer HERO 1 with exceptional maneuverability. On-board HERO 1 is an 8-bit 6808 microprocessor that can guide the robot through complex maneuvers, activate and monitor sensors, and modify actions as a result of sensor or real-time clock inputs. HERO 1 also has 8K of ROM as well as 4K of RAM. A top-mounted breadboard lets you conduct experiments and interface circuits of your own design to the on-board microprocessor. Plus HERO 1 comes with a six 7-segment LED display for viewing memory addresses, data and program steps. Commanding HERO 1 is easy with four different methods available to you. A top-mounted 17-key hexadecimal keyboard lets you easily enter, verify and modify programs, and select operating modes. An attachable Teaching Pendant lets you manually control all motor and arm movements, or store them for later duplication. Or you can control HERO 1 with an optional remote, radio frequency controlled transmitter available in two models, each operating at a different frequency. You can also guide HERO 1 by directly linking a host computer with the help of the optional Memory Expansion Board and RS-232 Interface that plugs into the top experimental HERO 1 breadboard. HERO 1 is powered by four gel cell rechargeable batteries. A 120/240 VAC, 50/60 Hz charger is included. HERO 1 is 20″ high, 18″ in diameter and weights 39 lbs. with accessories. 6808 CPU (8-bit), 4K of RAM (2 6116 static RAM chips), 8K of ROM (With Robot monitor), Experimenter Board on the head, Sonar ranging on head, Ultrasonic motion detector on head, light sensor on head, sound sensor on head, Cassette I/O for program storage, head rotates 350 degrees, 2 fixed wheels, 1 steerable drive wheel (it’s in front), 6 Seven segment LED displays, 17 digit Hex keypad (with Real keys) on head, Teaching pendant, Charger. A picture of the HERO 1 without the covers. The HERO 1 uses Stepper motors for everything except for the main drive motor. It also has separate boards for each function. NEW LINK! See HERO 1 in action on an old episode of the Computer Chronicles. Meet the first affordable, personal robot with a dynamic personality. HERO JR. A friendly robot, HERO JR will fit right in with your family and into your home. It sings songs, plays games, tells nursery rhymes, recites poems, guards your home and can even wake you in the morning and guide you through an exercise routine. HERO JR explores its surroundings and seeks to remain near human companions. HERO JR’s personality is preprogrammed and doesn’t require computer programming skills to operate. If you do wish to program HERO JR, you can with a home computer and optional RS-232 Accessory and BASIC Cartridge. The traits comprising HERO JR’s personality include: singing songs like “Daisy” and “America”; saying preprogrammed phrases; exploring and moving about, using sensors to avoid obstacles and seek out humans; playing games; telling nursery rhymes; and gabbing in “Roblish.” All routines are stored in 32k ROM. Add more functions with optional plug-in cartridges. In addition to these six traits, HERO JR has an internal clock with a 100-year calendar that can even compensate for Daylight Savings Time. With this time-keeping ability, HERO JR can act as an alarm clock and awaken you at a specified time. After your wake-up call, it listens to be sure you are awake or permits two ten minute snoozes if you desire. It can also be made to announce the week day, date and time at set intervals or just at one important time and date. With 2k of RAM, HERO JR can store and remind you of events such as birthdays and anniversaries – up to 16 dates per year. A DEMO feature activates a built-in “Robot Variety Show” which demonstrates the Robot’s ability to see, hear, speak, tell time and move. You can even participate in the show. To see, hear, speak, and to move about, HERO JR uses a light sensor, ultrasonic sonar, sound detector, speech synthesizer and an internal clock which are controlled by an on-board computer using a Motorola 6808 microprocessor. The sonar is accurate from 4.5″ to 13′. An optional infrared sensor adds superior heat/motion detection. HERO JR duplicates all English sounds using its Votrax SC-01 phoneme synthesizer. This permits the Robot to say just about anything. Volume and pitch adjustments tailor the Robot’s voice to your liking. All of HERO JR’s vocabulary is preprogrammed. HERO JR can guard your home against intruders and can be used with the GDA-2800 Security System. The Robot give a verbal warning and asks for a password when its sensors detect a presence. The wrong or no response causes HERO JR to activate the security system. HERO JR normally speaks, sings and performs tasks between moving randomly about, however, an optional wireless remote unit allows the Robot to be manually driven from place to place. It will speak while under remote control. Remote operates and 75Mhz up to 100′. NOTE: The Security Transmitter and Receiver pair for the HERO JR can still be purchased. They are made by Linear Electronics (800) 421-1587 and can be ordered from any of their distributors. The Transmitter is Model # D-21A and the part # SNT00004. The Receiver is Model # D-67 and the part # SNR00032. You should be able to purchase the pair for under $60. The transmitter will bolt right into the robot and the built in security routines can then set off the receiver which can be attached to any alarm system. HERO JR is powered by two six-volt rechargeable batteries and plug in wall charger (included). HERO JR operates about 4 hours, with a normal amount of exploring. The Robot will randomly enter a sleep mode which conserves battery power by keeping only critical circuits energized. You can also make HERO JR enter or leave this mode. HERO JR can carry your favorite beverage (up to 10 lbs.) in a 94 cubic inch compartment. HERO JR has a 17-key keypad which lets you modify its personality to initiate a task. The keypad has clearly marked function keys including Sing, Play, Poet, Gab, Alarm, Guard, Help, Plan, Setup, and Enter. Eight LED’s flash in time with speech. HERO JR is 19″ tall and is easily assembled in about 20 hours. 6808 CPU (8-bit), 2K of RAM (6116 static RAM chip) Expandable to 24k, 32K of ROM (With Robot monitor), Speech built in (SC-01 based), Sonar ranging on head (Polaroid), light sensor on head, sound sensor on head, head does not rotate, 2 fixed wheels, 1 steerable drive wheel (it’s in back), 9 LED’s for a display, 17 digit Hex keypad (with Rubber keys) on head, Charger. RTA-1-2 Remote control accessory offers manual, wireless control of HERO JR’s movements up to 100′ away, operates at 75Mhz. NEW: HERO Jr Master Cartridge that contains all twelve of the above cartridges listed above in a single cartridge! This is simple the best option for your HERO Jr robot. These are available now. Please contact the Robot Workshop rdoerr@bizserve.com for pricing and availability. HERO JR note: HERO JR drives backwards compared to the HERO 1. The main drive system is similar, but the drive and steering are in the back. I have heard the Heathkit reversed the platform because it have better control and the steering was more accurate. If anyone can confirm or deny this please let me know. HERO 2000 features advanced programmability. This incredible robot has a 16-bit 8088 master microprocessor that runs user programs and eleven 8-bit peripheral microprocessors. This lets you simultaneously operate HERO 2000’s sensory and manipulative functions. There’s also HERO 2000 BASIC stored in the 64K ROM, while other built-in programs are for demonstrations, diagnostics and sensor adjustment routines. What’s more, HERO 2000 can even write its own BASIC program. HERO 2000 has unbelievable expandability. 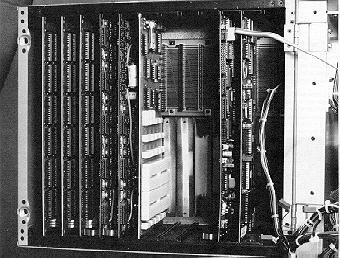 Besides having amazing computational abilities, HERO 2000 features 24K of RAM expandable to 576K – with the use of three optional memory boards. Each memory board contains 64K of RAM and will accept two additional 64K RAM chip sets. The new disk drive accessory (optional) expands HERO’s capabilities by allowing you to store and retrieve programs and data on a 5 1/4″ floppy disk. The drive includes the MS-DOS operating system and requires the ETW-19-15 Expansion Board with a minimum of 128K RAM installed for use with your HERO 2000. HERO possesses unsurpassed flexibility. Over a dozen programs are available on the optional demonstration ROM to show you the versatility of the electronically synthesized voice and built-in sensors. The synthesized voice lets HERO talk, play music and even emit sound effects. And for easy programming, HERO 2000 has direct text-to-speech conversion. The built-in sensors include: a 360 degree sonar with a range of 4.5 inches to 10.5 feet; a light scanner with 255-level coverage at 24 bearings, 15 degrees apart; a temperature sensor that covers from +60 degrees F to +90 degrees F; and a sound sensor that picks up 255 audio levels. And for maneuverability and manual dexterity, HERO 2000 is second to none. The optional robot arm is multi-jointed with a gripper that has a sense of touch. The arm lifts one pound in any direction, plus has full wrist action and accurate repeatability. Additionally, a powerful two-wheel dual servo-motor drive system pulls up to 26 pounds, while an optional auto docking accessory enables HERO 2000 to automatically dock with its charger when a low battery is detected. With all these abilities, you’ll think this robot is almost human! Everything’s totally under your control. You’ll be able to access ROM routines and perform movements from the top-mounted hexadecimal keypad or the optional wireless remote control. The remote control console features a typewriter-type ASCII keyboard, 80-character LCD display and teaching pendant controls. This incredible console permits wireless control and programming of all functions up to 100 feet away. There’s even a two-way radio data link between console and robot. HERO 2000 requires the Remote Console or a computer terminal for programming and checkout routines. Other sensational features include sixteen head-mounted LED status indicators (eight are user definable) to show you what function HERO is performing. And with three power modes, HERO 2000 is able to operate up to six days on its single 24 amp-hour battery. A 120 VAC charger is also included. HERO 2000 – by far the smartest, most versatile and easy to use robot trainer around. Main processor Intel 8088 CPU (16-bit), 6 slave processors (11 with optional Arm), 24K RAM (expandable to 576k with optional Memory cards), 64K ROM with built in BASIC (Full version of BASIC), Speech SPA-256, 360 degree sonar (24 bearings) and light sensor (255 levels), Stationary sonar rangefinder in the base, Two RS-232 ports (one for a Terminal and the other for a printer), Passive backplane supports up to 12 Cards. NEW: H2KIDE – Memory/IDE controller. This card adds up to 640K of memory to the HERO 2000 and also provides an IDE controller to add a Hard Drive to the robot. This card provides more memory than three fully populated ETW-19-15 memory boards! Want the coolest option for you HERO?? This card is available now. Just contact the Robot Workshop for pricing and availability. Another new option (H2KGIO) is in the works. It is a generic I/O card for the HERO 2000 that will add an 8254 counter timer chip, two 8255 PIA chips (24 bits each), one ADC0817 8bit 16 channel Analog/Digital converter, and one DAC0832 8bit Digital/Analog converter. The final card may also have a couple of on board relays for sonar switching and Opto’s for extra inputs. The Robot Arm Trainer is designed to simulate the operation of full scale industrial robots. It’s the most effective and complete learning aid available. And it’s simple to understand and operate, so you can spend your time learning by doing. The Trainer features five axes of motion, including wrist pitch and roll for precise pick-and-place movements. The Arm can lift 1 lb., Gripper force is 0 to 3 3/4 lbs., while the gripper opening is 4 3/8″. There’s also a patented sense-of-touch gripper that is programmable to exert specific amounts of force. Range of motion for the torso is -180 to 170 degrees; for the arm, 0 to 140 degrees; for the elbow, 0 to 180 degrees; for the wrist pitch, -90 to 180 degrees; for wrist roll, -180 to 180 degrees; and for the gripper, 0 to 8 arbitrary units. The axes speed of motion for the torso is 8 to 33 degrees per second; for the Arm and elbow, 3 to 15 degrees per second; for the wrist pitch and roll 15 to 70 degrees per second; and for the gripper, 1.8 degrees per second. An on-board 8-bit CPU and six slave microprocessors control simultaneous operation of all the Trainer’s functions. No external computer is required for operation. Six closed-loop DC servomotors provide smooth motion and accurately move the Arm through all its axes. The closed-loop system monitors both speed and position of each servomotor and reports to the controlling microprocessor. In addition, the Trainer has menu-driven software that’s programmed to provide you with command options. It leads you through the Trainer’s operations and eliminates the need for constant reference to manuals. You can also program the Trainer to do tasks consisting of up to 50 steps and even link tasks to create larger application programs. And it’s easy to simulate real industrial applications with the Trainer’s exact repeatability and accuracy. The Robot Arm Trainer also has protective features that make it safe for beginners or trainees. The top-mounted Emergency Stop Switch interrupts the Trainer instantly without aborting the task in progress. Reset the switch and the Trainer resumes the task at the point of interruption. Also, built-in software limits ensure that the Trainer won’t be damaged by exceeding its physical limitations, even if commanded to do so. Protective shrouds keep you away from the Trainer’s moving parts. Also included in this practical and comprehensive trainer package is 48KB RAM, 32KB ROM, and a Z80A control CPU operating at 4 Mhz. The Robot Arm Trainer also comes with an industrial-type teaching pendant with a 17-key membrane pad and 16-character LCD readout, and a built-in RS-232 port to interface with a terminal or an external computer, allowing you to create, edit, and store programmed tasks at a computer terminal. An optional cassette interface accessory permits you to store programs on standard cassette tapes. In addition, an 8-channel status port can send and receive data signals, permitting the Robot Arm Trainer to communicate with external sensors and other robotic devices. An internal set of diagnostic routines aid in alignment procedures and provide system checks. Now you can learn the fundamentals of robotics in industry and turn your understanding of robotics theory into hands-on experience with the Robot Arm Trainer. Trainer includes arm and base – both built to last. I/O board for use with optional courseware.